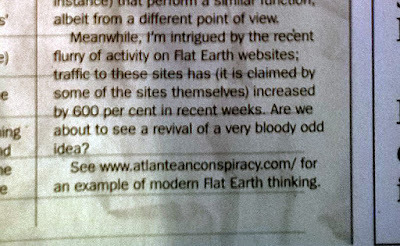 Earlier this year I noticed a mention of the Flat Earth revival in the pages of the alternative magazine Fortean Times. That was in the September 2015 edition and it briefly noted the recent "flurry of activity on Flat Earth websites" and referenced Eric Dubay's Atlantean Conspiracy website. The mention came in the Conspirasphere section of the magazine. 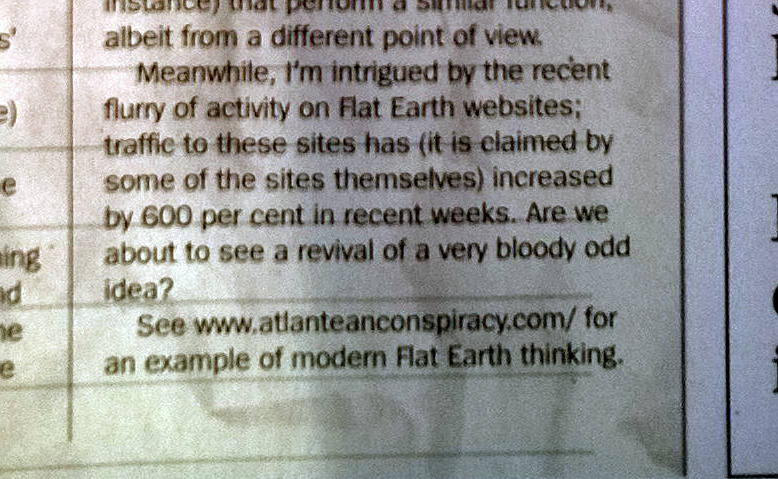 For context Fortean Times is a magazine that likes to have its cake and eat it when it comes to conspiracies. Discussing them within its pages, but doing so with a healthy dose of mainstream scepticism and humour. I can't really complain about this too much, as I sometimes do it myself on these pages. Anyway, the mention seemed like a little breakthrough for Flat Earth and I took it as a sign that the movement was indeed growing the way it seemed to be growing on YouTube. Since then I've been keeping a look out for further mentions. So far there hasn't been another direct mention of Flat Earth to my knowledge, however I do keep seeing indications that they're keeping an eye on things. 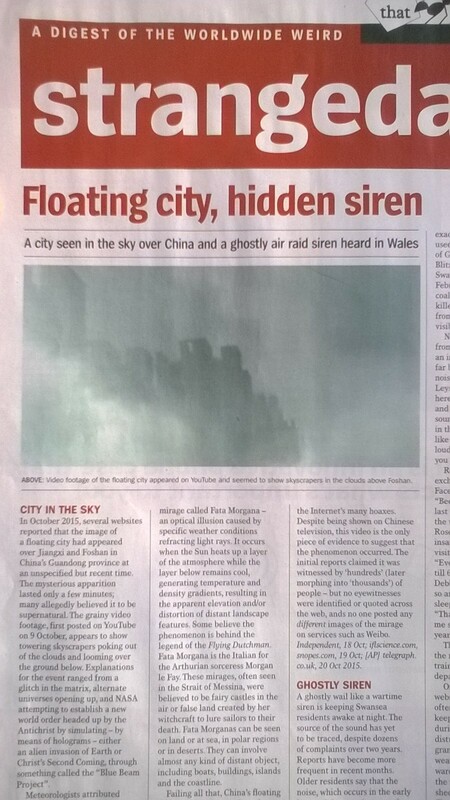 For example, in the latest edition (December 2015) they mention the floating city that was seen over China. To be fair this is the sort of thing that Fortean Times would normally report on, but what was telling was its reference to claims that 'NASA' were responsible for the event - not the usual CIA/Military/HAARP bad guys that usually take the blame for such things. The December edition also mentioned the Stephen Hawking conspiracy theories that are out there right now - the ones that point out the fact that Hawking is by far the longest living survivor of Lou Gehrig's Disease, and that suggest that the Stephen Hawking "character" has been portrayed over the years by a series of body doubles. Again this is a conspiracy theory rooted in the realms of Fake Space/Fake NASA and Fake Science. Sadly, they don't mention Math Powerland's Stephen Hawking vids though. Deep down I'm hoping that at some point they'll do a full cover story about Flat Earth, but I think that may be a long time coming. Even if Flat Earth has aroused their curiosity, I think it still seems to be a little taboo - even for those writing from an observer, rather than a believer, perspective. I'll keep a lookout though. I remember playing the same game with Fortean Times regarding 9/11. Wondering when they would finally start mentioning the mountains of alternative material out there about it. At first it started appearing in the magazine, but with a "how can people believe this stuff?" sense of derision. Then gradually that started morphing into a more tacit acceptance that maybe the conspiracy theorists have it right about some things. In fact, in last months edition (November 2015) they discuss, again in the Conspirasphere section of the magazine, how the conspiracy industry has grown so big that it's started to develop a mainstream and an alternative of its own. And also how it's started to develop a "tabloid/broadsheet" divide, with sensationalist conspiracy theorists like Alex Jones on the one side and more "academic" theorists on the other. It's almost like the writers of Fortean Times are trying to justify their own obvious interest in the subject ;) ..hoping that they can somehow exist on the more respectable side of the divide without acquiring all the negative connotations of the "conspiracy theorist" label.